Disney Cruise Line introduces first-ever Marvel Day at Sea on select Disney Magic sailings from New York in Fall 2017! Take a stand alongside some of Marvel’s mightiest heroes for an exciting day-long adventure—available on select sailings from New York in Fall 2017. 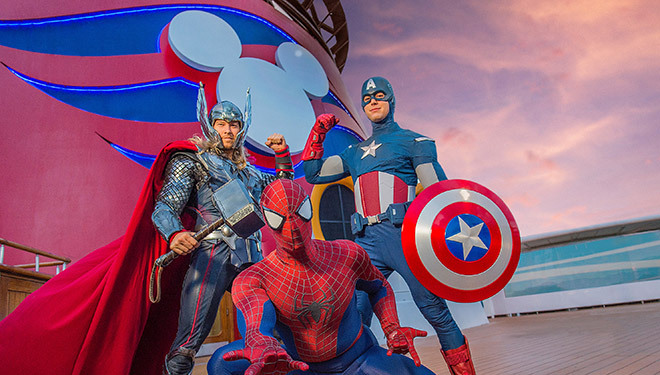 Marvel Day at Sea—a heroic celebration of the Marvel Universe—is a one-day extravaganza available on select sailings from New York in October and November of 2017. For the remainder of your voyage, look forward to a thrilling itinerary of entertainment and activities-from Broadway-style shows and innovative dining to immersive Port Adventures.